For under $200, you can get a pretty respectable set of binoculars for hunting, just don’t let anyone tell you they are merely “entry level”. They will likely be slightly bulkier, dimmer, and less sharp when compared to the top hunting binoculars in other price ranges. However, many people would actually have some difficulty even detecting these slight differences in performance. If you are simply looking for some workhorse binoculars that can do it all from the tree stand, blind, or your back porch, then $200 will get a fine pair of hunting optics. I’ll compare five models with price tags under $200, which is perfect for the budget minded hunter. The Vortex Crossfire II binoculars are like all the other Vortex optics, in that they have features and build quality you’d expect for a pair costing twice as much. The Crossfire II come in both 8×42 and 10×42 sizes, and is highly user friendly. They have twist up eye cups, a large center focus wheel, and a locking diopter for perfect focus. No other model in this list has that level of adjustability. The chassis is armored with rubberized grips, the tubes are nitrogen purged, and are completely fog-proof and waterproof. As for the optical performance, even though this is entry level optics, the Crossfire II does not disappoint. The lenses are full multicoated, with anti-reflection coatings on every glass surface in contact with the air. This translates to increased light transmission and clearer imagery. The black rubberized design of the Nikon Prostaff 7S makes them rugged, waterproof, and fog proof, all of which should be important to serious hunters. The Prostaff 7S feature fully multi-coated lenses that can ensure a brighter, sharper image, with excellent clarity. They also sport a multilayer prism coating with phase correction, which help transmit the maximum amount of light. These binoculars are sealed with an o-ring to keep moisture from getting inside, and are nitrogen filled to deny fog from building up. The Prostaff 7S are the lightest 10×42 binoculars on this list, weighing just 22.7 ounces, and measuring 6.4 inches long. If you wear eyeglasses, you won’t have to take them off to use these binoculars, because they provide excellent eye relief so your glasses won’t interfere or cause pain. The Aculon binoculars are unique in that they are zoom binoculars. The magnification can go from 8x to 18x by simply turning the center dial with your fingertip. We can think of several ways this is useful for hunters. 8x magnification for regular field use. High magnification for the shooting range. Use as stand in for a spotting scope. Other outdoor recreation like hiking and star gazing. Now, the Aculon is not going to replace a good spotting scope. If you don’t want to deal with the cumbersome setup of a spotter, the zoom function allows you to be more versatile. There is a tripod adapter so going from spotting to regular viewing is simple. The Aculon 8-18×42 are the best zoom hunting binoculars for a few reasons. The lenses are multicoated eco-glass, with an aspherical shape. These are porro prism binoculars which is they have the wide body. Remember that porro prisms can be superior in many ways. Users report bright images with a satisfyingly bright picture. Some people have complained that they must refocus after zooming, but they fail to realize that optics are not like a digital camera with auto focus. The Prostaff 5 are the little brother to the Prostaff 7 series. They are decent, everyday binoculars you can rely on, even though they don’t have the high end features of the Monarch series. If you have good vision, you might do better to pay extra and get the ED lenses with phase coated prisms. For everyone else who must stay under the $200 mark, the Prostaff 5 are good options. 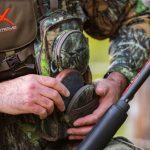 The Prostaff are made from a fiberglass and polycarbonate composite material, which is why they weight just 22.8 ounces. These binoculars are o-ring and nitrogen sealed to make them both water and fog proof. They have a decent 330 foot field of view at 1,000 yards and have multicoated lenses to get the good brightness that hunters need. The Alpen Shasta Ridge are the entry level binoculars from the southern California optics company. The Shasta Ridge comes in 8×42 and 10×42 configurations, in a compact roof prism design. There is a hunter green and a silk screened camouflage version that is really sharp looking. Like others on this list, the lenses are multi-coated fully, with an additional phase coatings for true color production. Alpen has used the high quality BaK4 glass that is expected on higher end binoculars. The Shasta’s have a large center focus, that is a little stiff to begin with, but should break in after some use. For the glasses wearer, there is twist up eye cups for comfort. On the right eyepiece there is the always welcome locking diopter adjustment. A few things I really like from this pair is the soft rubber lens covers that actually stay in place, and the strap that is included is much more than the afterthought it is on even high end binoculars. The strap is a ballistic nylon, with a rubberized foam covering. Also of note is the nice rain guards, again, they actually work and were not a throwaway add on at the end. For their price, I think most hunters will be happy with the Alpen Shasta Ridge because of the high build quality, and the bright, sharp images the optics produce. The Vanguard Spirit XF are a close relative to the Spirit ED, with the main difference being the grade of glass featured in the lenses. The Spirit XF has standard glass, while the Spirit ED has an “enhanced definition” glass. The other main difference is the bridge design. The XF has on open bridge construction, while the ED is built on a sturdy center column. Both designs are good, it just may come down to personal preference as to which is easier to hold onto. A good binocular harness will erase any difficulties you have holding onto these or any other binoculars. Vanguard is known for producing sharp optics with excellent edge to edge clarity, and even the Spirit XF’s have shown to live up to that reputation. The most common complaint on this pair appears to be its weight and color reproduction. All I can say is the Spirit XF are plenty light, weighing less than 3 other models on this list. It is true that the colors you’ll get will not compare to more expensive binoculars, but that is what you get at this price range. Finding a quality pair of hunting binoculars is not always easy. Most times the quality will be associated with their cost, but fortunately the manufacturers have listened to the marketplace, and you’ve now seen 6 different entry level models for under $200, each performing like premium binoculars. If you think you want to jump up a level in quality and better optics, we wrote similar guides for hunting binoculars under $300. If you are not impressed with any of those models, we also reviewed multiple high end hunting binoculars under $500. Remember, take note of all the features of each set, determine where you will be hunting and how often, and then choose the set that you believe is best for you. If you choose to invest in one of these top hunting binoculars reviewed above, you can rest assured that you will be getting a great product that is durable and will last you through years of hunting.